After one of the most swash-bucklin' UFC cards ever, one that encapsulated all that I love about the UFC as three Championship belts changed hands and all three fighters who lost their belts showcased humility and professionalism in defeat, a card in which new women's straw-weight champion Rose Namajunas told everyone watching to focus on being good people, spreading positive vibes in her moment of glory and a card that featured the return of George St-Pierre in glorious fashion, all I could wonder was; what's cracking with Robert Whittaker? GSP's return was monumental and for a fighter to take that much time away from the sport, then seamlessly slide back in and get busy in choking Michael Bisping, is testament of the athlete GSP is. Bisping definitely played his part in making that fight what it was as he caused some heavy damage to GSP, from his back after GSP had taken him down and Bisping went out in typical Bisping fashion as he didn't tap. The truth however, is that since GSP vs Bisping became official, I was always looking off into the future with Whittaker set to unify the middleweight belts against the winner. Of course, the GSP vs Bisping fight had me fizzing but that's an example of how deep the layers of funk in this card went as I was hyped for the GSP vs Bisping fight and equally hyped for what it would mean for Whittaker. There's been a lot of noise about Whittaker not getting that fight against the winner, with many people suggesting that there are bigger fights for the UFC to make (thus making more dosh). After GSP's win, Tyron Woodley got busy on Twitter and called out GSP, lining himself up with a super-fight and the general vibe to me from a variety of different parties, felt like Whittaker was being slept on, that he wasn't being given his dues. Post-fight, Dana White said that Whittaker's next, so no dramas. Right now, I reckon we can safely say that GSP is the best UFC fighter ever. 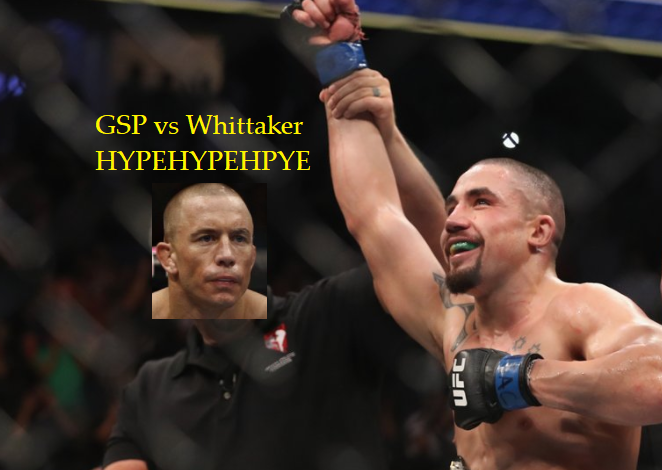 GSP and Whittaker both have Mixed Martial Arts foundations in karate, Whittaker's takedown defence is exceptional and GSP's got the best takedowns in the UFC. There's all sorts of funk in this match up, that and the details of when and where this fight goes down will have to wait for another day though. UFC announced UFC 221 will be in Perth on February 11 next year, which would be lovely for Whittaker vs GSP, I just don't think it'll happen like that and it would make more sense for GSP to defend his belt in Canada. If this unification bout is scheduled for Perth, well the hype only reaches insane levels. Whittaker isn't fussy though, he's a low key kiwi-Aussie who will fight anywhere, so no dramas if it's not in Perth. TJ Dillashaw bounced back from a first round knockdown against Cody Garbrandt, to land hefty shots on Garbrandt and reclaim the Bantamweight Championship. Dillashaw wore a typically brutal Garbrandt punch on his chin and Garbrandt then repeated the shenanigans from the win over Dominick Cruz where his evasive movement morphed into 'showmanship' as Dillashaw kept flinging stray kicks Garbrandt's way. With Garbrandt's hands low, Dillashaw then threw a heavy right hook that knocked Garbrandt down and Dillashaw pounced. There weren't Dillashaw's trademark takedowns, where he shoots with a level-change, he stood and traded shots with one of the better boxers in the UFC and came out on top. There are all sorts of options available to Dillashaw now and he immediately called out Demetrious Johnson, with Dillashaw willing to drop down to flyweight and try break Mighty Mouse's streak, claiming two division belts in the process. Before all of this, Rose Namajunas unleashed a first-round win over women's Straweight Champion Joanna Jedrzejczyk. This was the most shocking result of them all and Namajunas showcased soul-snatching power, dropping Jedrzejczyk with one punch - a left hook after she had flexed her range in landing an early jab that landed flush. Hit an ad like a Rose left hook if you enjoyed the read. You'll be making a donation without having to do anything and showing your support to the Niche Cache. Shout out to you, we appreciate you and try keep it real for youz.